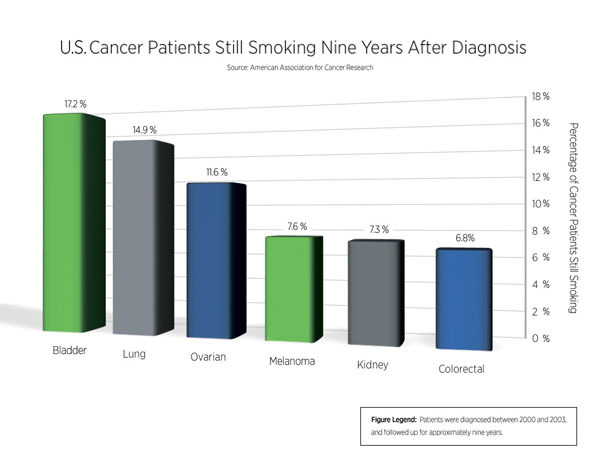 A report in Cancer Epidemiology, Biomarkers & Prevention, a journal of the American Association for Cancer Research, illustrates the prevalence of smoking among cancer survivors. Roy Herbst, MD, PhD, chief of medical oncology at Yale University Cancer Center, is chair of the AACR Tobacco and Cancer Subcommittee. He said the ACS findings were illustrative of the problem outlined in the AACR’s recent policy statement on tobacco, which recommended that smoking cessation be part of any cancer treatment. Read the press release, which was covered in TIME, USA Today, and HealthDay.